Founded in 2009, the Karabots Junior Fellows Program is a three-year program aimed at Philadelphia high school students from economically underserved communities. The program seeks to foster interest in careers in healthcare and medicine through hands-on learning and interaction with professionals. The program also provides academic counseling and support to better prepare these students for college and their future careers. Through the resources of the College of Physicians of Philadelphia, including the Mütter Museum, the Historical Medical Library, and the College’s vast network of Fellows, our dedicated instructors seek to provide a safe, friendly, and engaging environment for students to obtain a unique education and prepare for their futures. The Karabots Junior Fellows Program is made possible through the generous contributions of Nicholas and Athena Karabots and the Karabots Foundation. For more detailed information on past events and activities related to the Karabots Junior Fellows Program, see our Archive. Who is eligible for the KJF Program? How can I find more information about the Program? 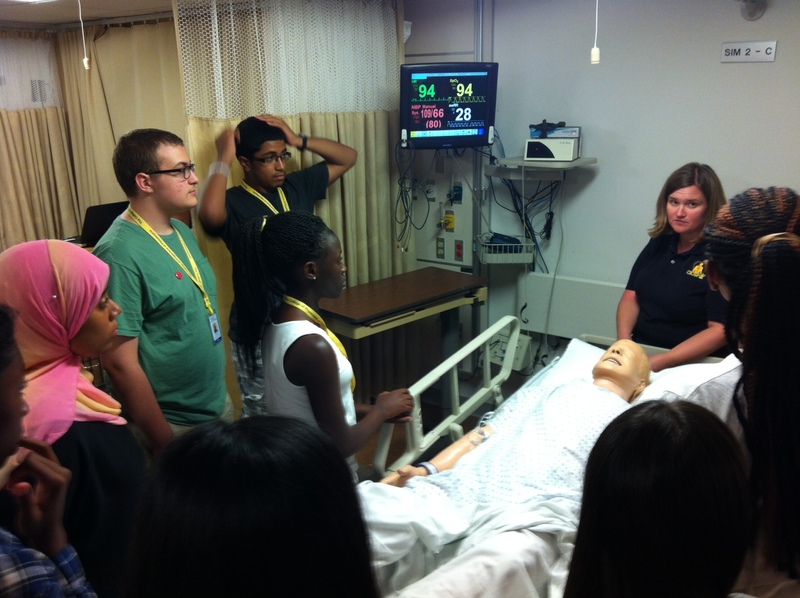 In the summer prior to their sophomore year, Fellows will take part in an intensive 2-week program involving workshops, hands-on activities, field trips and meetings with healthcare professionals. During the course of their sophomore year, students will take part in a year of programs and activities related to an overarching theme in healthcare, such as toxicology, pathology, or forensic science. They will also work together with College professionals to develop a final project. Past projects have included exhibits that have appeared in the Mutter Museum. These programs take place once a week after school and one Saturday a month. During the second year, students will take part in internships at the College followed by an externship with a healthcare professional of their choice. Each student will also be paired with a College fellow who will serve as a mentor. During the final year of the program, students will take part in workshops related to the College search. They will receive assistance in such areas as SAT/ACT preparation, assistance with college admissions applications, and career counseling. With the exception of off-site field trips and individual externships, all programs will be held at the College of Physicians of Philadelphia (19 South 22nd Street). Transit tokens to and from all events will be supplied to the Fellows by the Center for Education and Public Initiatives. Students will also be paid a stipend upon successful completion of the program. They must be attending a Philadelphia high school. If selected for the program, candidates should also be interested in continuing the program through the school year and summer through senior year of high school. To apply, interested candidates must complete our online application. The application must include the name and contact information of an adult supporter (parent, guardian, or adult over the age of 18 willing to vouch for the student), a reference from a teacher or counselor, and a brief personal statement in the form of an essay, video, or audio clip. The adult supporter must be willing to attend the applicant’s interview if they are considered for the program. The deadline to apply is 11:59PM on Tuesday, April 30, 2019. Teachers may also recommend students whom they feel would be a good fit for the program. Recommendations can be sent via email to Kevin D. Impellizeri, Assistant Director of the Karabots Junior Fellows Program (email: kimpellizeri@collegeofphysicians.org, phone: 215-372-7313). Notes for teachers: when recommending a student please include the student’s name as well as your name, title, and contact information. Teachers may recommend more than one student for the program. Enrollment of new fellows takes place every two years. We are currently accepting applications for the Summer 2019 cohort of the Karabots Junior Fellows Program. Accepted students will take place in an intensive two-week program August 12-23, 2019, with the possibility of staying on for a three-year summer and after-school program through twelfth grade. The deadline to apply is 11:59PM on Tuesday, April 30, 2019. Enrollment is limited to no more than 24 students per cohort. There are no costs to enroll or be enrolled in the program. How can I find out more information about the Program? For more information contact the Center for Education. For updates on the program and to learn more about the activities available to the students feel free to check our blog or follow the Center for Education on Twitter and Instagram (@mutterEDU). If you have additional questions, contact Kevin D. Impellizeri, Assistant Director of the Karabots Junior Fellows Program (kimpellizeri@collegeofphysicians.org, 215-372-7313).